Given my relative simplicity, keeping myself happy and entertained isn’t too difficult. I’m not getting philosophical, mulling over my ability to achieve true happiness, or any such nonsense. No one is actually happy; if someone says they are, they’re lying and should be punished for their false witnessing. Personally, I’ve found the most sure-fire way to come closest to true happiness is through a series of small victories. I might never actually like myself, be pleased with my level of success, or have any sense of pride, so dwelling on that will only lead to crippling depression. This is off to a horrible, melancholic start. We need to turn the mood around and do a complete 140. Not a full 180 since, well… it’s not going to get that much better in here. I figure a constant diet of small, superficial distractions will provide me some semblance of steady joy. If I never achieve any sort of nirvana, it will be okay, since hopefully I will be too entertained by nutritionally-devoid food and pop-culture minutia to notice anything is lacking. Is this a poor method? Almost definitely. On the other hand, it is easy and focuses on instant gratification, two of my favorite qualities. That said, there are a lot of people familiar with my favorite things in life, from reading this site. And if you are familiar with my favorite things from methods other than reading this site, that’s kind of creepy. Stop it. Point being, I found something while shopping recently, that fills many of my criteria for a truly awesome product. While browsing the cereal aisle (I went with “browsing, because it makes me look much less maniacal then the more accurate “analyzing”), my attention was immediately drawn to a very bright, garishly colored section of boxes. Upon closer inspection, I discovered it was an assortment of new Disney cereals. This seemed like the perfect combination of traits: cereal, Disney, and something that probably won’t be around for too much longer. Unfortunately, further inspection made me realize that these cereals were actually pretty lame. Disney has had its fair share of cereals in the past (that Pooh Honey Bee cereal was awesome), but this line seemed especially lazy. Mickey’s cereal was some sort of Trix-Fruity Pebbles bastardization; the Little Einsteins cereal did as well, except it was star shaped. Finally, the Princess cereal appeared to be simply Frosted Flakes. Sadly, even my normally impulsive decision making skills couldn’t convince me to buy any of them. I wanted to want them, but unfortunately the interest just wasn’t there. When I see a new, interesting cereal, I get far more excited than most people do, or should. Unfortunately, the Disney cereals didn’t spark anything inside me; they didn’t make my blood flow quicken or my eyes dilate, or anything else my cereal lust tends to do to me. As luck would have it, when I got home that night, there it was – the Princess cereal. Admittedly, that’s not very exciting. Trust me, there was no sense of “wow” or “hey!”, it was more of an understated “Huh, look at that.” Regardless, the tiny bit of weirdness of the cereal being home after just having seen it was interesting enough to resuscitate my curiosity just enough. The sad fact is this cereal has almost nothing going for it. Actually, that’s not true. Its box has the Disney Princesses on it; its bright coloring drawing children’s eyes towards it. Luckily for Disney, putting their Princesses on a product is as close as they can legally come to Disney printing its own money. The Princesses are Disney’s most popular sellers, making them their hottest line. And by hot, I mean “very popular”, not “very attractive”. Okay fine, I meant it in that way as well. I will clarify that the cereal line has lots going for it, simply for being Disney branded. What I mean is the actual cereal, the food you wind up eating, has almost nothing going for it. 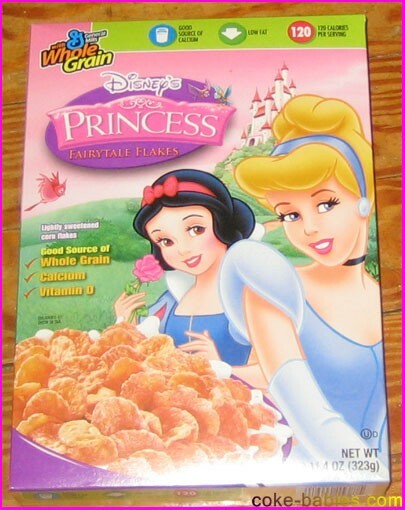 The Princess cereal is just Frosted Flakes. In fact, it’s even weirder than Frosted Flakes; it looks like Frosted Product 19. Except for one, truly awesome, difference: it’s pink. So without much fanfare, I ate a bowl of the cereal. And you will never guess how it actually tastes. Well, you actually can guess how it tastes. In fact, I’m sure of it. It tastes okay. I will actually give it a slightly higher grade, a “Pretty Good”. And that’s what you would expect. Frosted Flakes are pretty good. Their biggest strength is that you never get sick of them. There are certain cereals I love, but I wouldn’t want to eat box after box of them in a row; I need a break. Frosted Flakes, I could pretty much eat nonstop. I might not be too happy about it, but it wouldn’t be bad. What I like to do best with Frosted Flakes is use them to dilute another cereal, like Raisin Bran. This way I can eat a giant bowl of Raisin Bran, and not have to worry about violent stomach cramping, since the Frosted Flakes will help ease the massive fiber assault. Would I buy the Disney Princess cereal again? No. But then again, I didn’t even buy them in the first place, so that seems like a pretty good deal to me. I also have to worry about upholding my reputation. Can a tough, manly man be seen buying Princess cereal without looking foolish? No, and neither can I.